Pallina Villa is a place you can bring your family and feel completely at home. There is a comfortable ambience here that won’t leave you on pins and needles worrying about the kids. 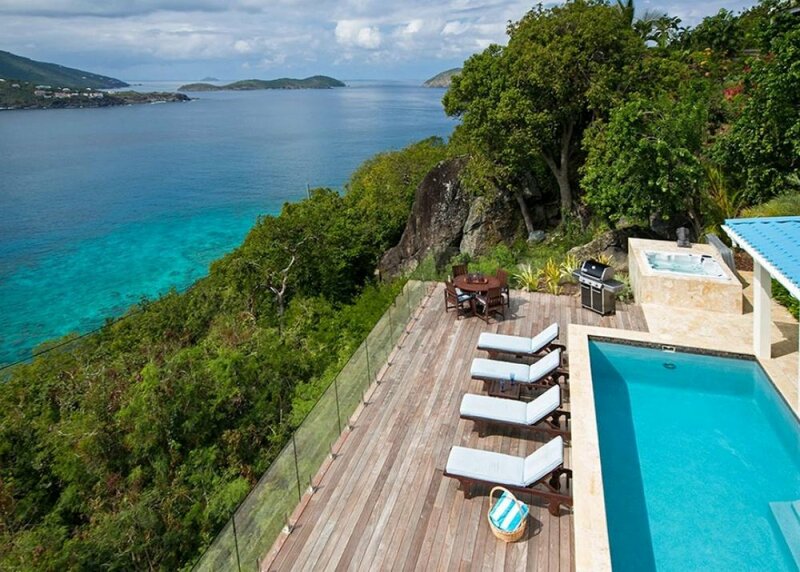 The pool deck overlooks Magens Bay, and there are plenty of distractions for the kids. Fire up the grill and enjoy supper on the covered veranda, and after the kids are tucked in for the night, head for the hot tub. Share a bottle of champagne or your favorite cold beverage with your significant other while you watch the sun set over the Caribbean Sea. Spectacular view over Magens Bay! Pallina Villa is a spacious, elegant oceanfront property on Magen’s Bay. This luxury villa offers sweeping ocean views in a quiet, residential location. Magen’s Bay and its mile-long white sand beach are within view from Pallina’s extensive terrace. Sunsets come alive from the glass-walled patio furnished with a dining table and loungers. The pool runs along a columned pavilion perfect for shaded relaxation edged with gardens. There’s also a Jacuzzi, BBQ grill, and an outdoor shower. There are multiple levels of verandas, patios, and gardens, so guests have plenty of space to spread out and relax. Sliding glass doors lead into the living room, which is furnished with a plush sectional, flatscreen TV, and direct access to both indoor and outdoor dining. The gourmet kitchen sits opposite the dining room, and it’s furnished with stainless steel appliances, onyx countertops, a wine cooler, and a breakfast bar. Two bedrooms are set on either side of the living area, and they both have a queen bed and a shared bathroom. There’s also a powder room in the adjacent hallway. There’s also a master suite on this level with a four-poster king bed, an ensuite bathroom, and a walk-in closet. An exterior staircase leads down to Pallina’s second master suite, which is essentially its own cottage. This suite has a king bed, an ensuite bathroom, a sitting room, a kitchen, a stackable washer/dryer, and a private terrace overlooking Magen’s Bay. Pallina is conveniently located a short drive from Magens Bay Beach, restaurants, shopping, and nightlife. Weekly housekeeping maintains the villa. Magen's Bay is a couple of minutes drive from Pallina.